In product management, there is a concept of the "Win/Loss" interview. Best applicable for B2B sales, but could be applied with success in various types of business. "Win/Loss" focuses on a purchasing process. It helps you to understand how your target clients think before purchasing a product. You could do "Win/Loss" interviews with both customers who selected your product and those who chosen a different solution. Your competitor's clients are your clients! How your customers did learn about you? Their decision making (purchasing process)? How did you know, if at all, about our company and product? Before our engagement, what was your perception of our products and services? What informational tools did you use for your consideration? What solution were you previously using? As you began the selection of a new solution, what were you originally looking for (your needs, issues, etc.)? What was the final ranking of the solutions considered? Where were we the strongest/weakest during the overall evaluation process? Would you recommend our solution to others? Those are your customers, right? They expressed their interest in your product very clearly by purchasing it. Even if your product is free - it still costs your clients time and attention. Those are quite evident indicators of value your clients are getting or expecting to get from your product. You most likely have a way to contact your customers. Do so. Ask them for a 30-45 min. interview. What was their experience using your product? What was the reason to cancel our solution? When have you made the decision to cancel? What did/didn't you like about our solution? How do you solve the problem after canceling our solution? What do you like the most about your new solution? In a case of a "loss" during a solution selection process, your goal is to find out same things as with a "win" interview. You may use the same questions as well. It's crucial to know why your clients chose your solution or a competitive one. This knowledge would help you to improve your overall marketing including product, positioning, price and promotion. 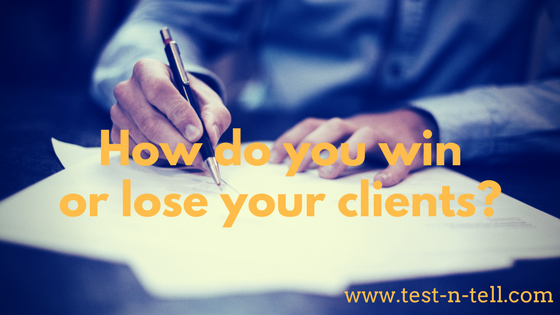 "Win/Loss" interview is a useful tool to structurally get insights into your clients purchasing process. After only 10 "Win/Loss" interviews you'd get actionable insights into your customer's decision-making process.